A life changing spiritual experience! If you are interested in a deep spiritual development, whilst resting amongst some of the most famous churches and shrines in Ukraine, which inspire you to live and create, then this tour is perfect for you! During this tour, you will visit the most famous shrines and temples of Ukraine, get the opportunity to enrich your spirituality, all whilst feeling the spirit of Ukraine and its culture. Welcome to the city of 'Golden domes' - the heart of our beautiful country. Kyiv is one of the oldest and most beautiful cities in Eastern Europe. Thousands of people visit Kyiv each year, in order to see the main churches and shrines of this stunning city. This place is endowed with a special energy that attracts pilgrims from all over the world. Heading West, we will visit the picturesque сity of Ternopil. It is a quiet, incredibly green city with a unique atmosphere, bright history and a plethora of interesting natural, historical and architectural sights. While here, we will make a trip to the most significant shrine of Orthodox faith in Western Ukraine - Pochayiv Lavra monastery. This place is famous for its rich history and a miraculous icon, the reason for which so many pilgrims visit for spiritual healing. Next we head to a diverse and multicultural city - Chernivtsi - here discover its long rich history. Enjoy a spiritual tour around the city. Visit the stunning local university. Travelling further, we will take a trip to the heart of the Carpathian mountains, and admire an old Hutsul church, which was built back in the 16th century and miraculously preserved to this day. On the way to Ivano-Frankivsk, we will stop and visit another beautiful church with amazing authentic icons from 17 century. 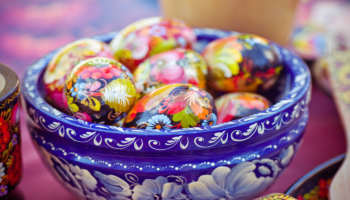 Also, we will have a great opportunity to visit the world-famous Pysanka Museum with an impressive collection of painted eggs. Take a trip to the Hoshiv Monastery – a major pilgrimage center for Greek catholic christians in western Ukraine. The monastery is known for its miraculous icon of Hoshiv, God's Mother. It was brought from Poland by a local nobleman Andriy Shuhay in the early 17th century. When fire came into his house and it burned down, the wall where the icon hung survived. That is why this place is visited by approximately two million pilgrims each year. Traveling to Lviv stop and visit Burshtyn and Rohatyn towns. It is from Rohatyn that the well-known woman Roksolana comes from, she made a significant contribution to the cultural development of the region. Being here we will also look at the oldest wooden church in Ukraine, which is part of the Unesco world heritage. Welcome to the 'Paris of Ukraine' - Lviv. Discover the religious side of this ancient city by visiting the most famous monuments associated with Christianity. Take a trip to one of the most prominent shrines - Univ Lavra. Feel the part of Ukrainians all around Ukraine – visit this beautiful monastery complex and feel spiritual power. Upon returning to Lviv, visit the Andrey Sheptytsky National Museum - one of the most important museums of national art and cultural treasures. Which was founded by the Bishop of the Ukrainian Greek Catholic Church in 1905. Also we will have excursion around Ukrainian Catholic University - place renowned for its high level of studying. This is a beautiful example of contemporary architecture and new methods of education. Visit the main cathedrals of Ukraine – St.Sophia and Kyiv Pechersk Monastery – a true Mecca for all Christians. See the most important pilgrimage sites - Zarvanytsia and Pochaiv. Enjoy different regions of Ukraine which are famous for their spiritual sites. Go with us to Carpathian Mountains rich in old wooden churches and nature that inspires. Visit Lviv – the cultural capital of Western Ukraine, “Ukrainian Paris”, a city that retains its historical spirit throughout ages.